After trying various methods, many pet owners are still wondering how to remove pet stain from their carpets. The fact is that pet stain removal can be a difficult procedure if you don’t know the proper removal techniques. Pet stains can quickly embed deep inside your carpet fibers, and can also change the colors of your carpet. Since urine is acidic, it can destroy many types of carpet fabrics and leave a horrible odor. This can lead to hygienic issues, and cause homeowners to worry about how their carpets will look to guests. One thing is for certain, if pet stains are not removed quickly from carpets, it can cause permanent damage. You might not be able to remove some stubborn old stains from your carpet without the services of a carpet cleaning company. It depends on how long they have been in your carpet, and the type of carpet you have. Some stains can be removed by following these important steps. Use Hand Protection – You should always use rubber gloves or other hand protection when you decide to clean old pet stains from a carpet. Also, make sure you wash your hands when you finish for extra protection. Blot Don’t Rub – It’s possible to use some dry paper towels to absorb as much of the stain as possible. It’s important to blot the stain and don’t rub it, because you could cause it to get deeper into the carpet fiber. After that, you can use a 4 to 1 solution of water and white vinegar (4 cups of water for every cup of vinegar). Pour the solution over the stain, let it soak for a couple of minutes, and then blot it up with more dry paper towels, and then rinse it off. Carpet Cleaning Pet Stain Products – There are numerous products on the market that are specifically made to remove pet stains. It’s probably best to ask your friends and family what products they use to get rid of pet stains and odors. Just follow the directions, and make sure you blot it out before rinsing it. Use Enzymes – There are specific pet stain products that contain enzymes that actually go to work and begin eating away the carpet stains. These products remove the stain, instead of just covering it up like some products. Use UV Light to Detect – A UV light (also known as a black light) can easily detect old pet stains in the dark. Just turn out the lights in the room and turn on the UV light. The pet stains will be lighter in color. Newer pet stains will be bright, but older stains will have a more faded appearance. Once you locate the area, you should clean them immediately. 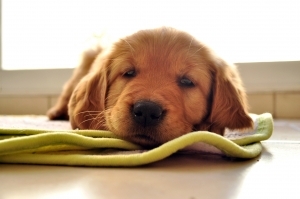 These are just a few simple ways that focus on pet stain removal from carpets. Whatever you try, make sure you test a small patch of the carpet first, just in case the detergent, or other cleaner, discolors the carpet. Remember, Renew Carpet Care, a professional carpet cleaning company, is always a phone call away (412-573-9291), and they can help you get your carpet looking like new again. Next Next post: What are the most difficult carpet stains to clean? How Does 3M Carpet Protector Work?